Choosing the right home inspector can be difficult, especially since a thorough inspection depends heavily on the inspector's own effort. That's why you need Rex Kulla from Custom Home Inspections, LLC to work for you. 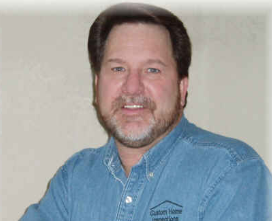 He is available to conduct efficient home inspection in Maple Grove, MN. Not only does Rex put forth the effort required for an effective inspection, but he abides by the industry's InterNACHI standards on every job. Whether you are preparing to sell your home or doing house hunting, it’s important to know whether your resources are going into something worthwhile. Count on Rex to be your dependable inspector so that you can close with confidence. Thanks to his extensive training and experience, Rex can help you determine whether the properties you are investing in are ready for market or require improvement. Your new home is an expensive investment, so don't let a cheap inspection give you a bad deal. You need a fully insured full-time inspector who is established in the industry. That is exactly what you get with our head inspector, major systems evaluation expert, and owner, Rex Kulla. Building and Safety Codes: It is important to know whether the property you are investing in is compliant with the current building, safety, and fire codes. Rex and his inspectors will examine every corner of the home, from the inside and out, and inform you about potential points of concern. Plumbing Inspections: The absence of clean drinking water and a safe plumbing and sewage system can make or break a property. Get the right information so you can make a proper decision. Rex and his company can conduct plumbing inspections for properties of any size. Radon Testing: Radon is known as a silent killer. Bad foundations and compromised ventilation systems can make any home a radon-ridden deathtrap. Before closing a deal, request a radon inspection from Rex and make sure the previous owners have addressed any potential problems. From new property inspection to getting your current home ready for market, working with a property inspector can provide valuable insight during your quest to buy or sell the perfect home. Rex and his property inspection team can facilitate many helpful inspections. We include detailed reports that will empower you to make smart decisions. View our complete suite of home inspection services. It all starts with a consultation and a pre-inspection agreement that is signed by the customer. Our inspection will then take place at the scheduled time. Inspections normally take around three to four hours, depending on the size of the property. Your inspection will never be cut short, and we will stay on site until all of the necessary information is gathered. You are encouraged to be there for at least the final hour of the inspection. This allows us to take conduct a room-by-room inspection, where we can explain our findings to you. Feel free to bring a list of questions and concerns; we are happy to answer them as accurately as possible. Payment for the inspection should be brought to the inspection as well (personal checks and cash are accepted). There is a property inspector near you. You can count on us to deliver clear, straightforward, and objective reports. Rex and his inspection team stay up-to-date with the latest building codes. As members of InterNACHI, we are committed to continuing education, improvement, and professionalism. When you hire us, you can have confidence knowing you will receive no-nonsense inspections that get to the point. Contact Custom Home Inspections, LLC, to find a property inspector near you. Rex and his team proudly serve Maple Grove, MN, including the Twin Cities metropolitan area.